Traffic Police statistics show that for the period from January to March this year, more people were arrested for drink-driving compared to the same period in 2012. In 2013, there were 706 arrests, compared to 675 arrests in 2012. The total number of people arrested for drink-driving in a year has also gone up. There were 2917 arrests in 2012 compared to 2735 the year before. In the latest operation, Traffic Police conducted road blocks at Still Road South, Sengkang East Road, Jurong West Avenue 2 and CTE slip road into Braddell Road. 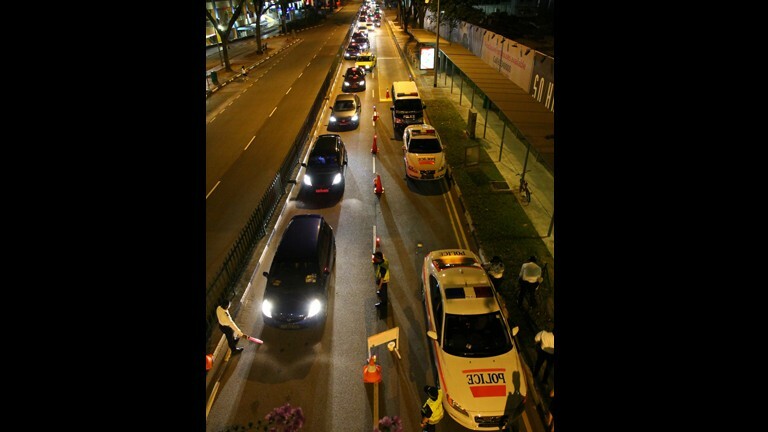 More than 43 drivers were stopped and tested for alcohol consumption. The ten drivers, nine men and one woman aged between 26 and 62, were arrested for drink-driving. Traffic Police said the highest Breath Evidential Analyser (BEA) test result was 69 microgrammes of alcohol per 100 millilitres of breath. The prescribed legal limit is 35 microgrammes of alcohol per 100 millilitres of breath. If found guilty, they will be disqualified from driving for at least 12 months. They will lose their driving licences and will have to retake the theory and practical driving tests in order to obtain their driving licences again. First-time offenders can be fined between S$1,000 and S$5,000, or jailed up to six months. Repeat offenders face a maximum fine of S$30,000 and a mandatory jail term of up to three years. They may also be caned up to six strokes, should death or serious injury be caused.